I stumbled across your article “The True Cost of Commuting” this week and I’ve been reading every other post since. (The side effect of this being I may get laid off from my job, which would be great too!) Brilliant stuff and great writing… thank you! While reading, I came across this challenge (Bike to Groceries). We don’t need groceries yet, so I decided that instead of riding to the grocery store, I’d commute to work at my Soul-Crushing-Huge-Telecom-in-Broomfield today. There’s absolutely ZERO reason why I don’t commute to work other than sheer laziness. It’s only 7.5 miles one-way with less than 1000′ of gain, bike lanes the entire way, low traffic, bike racks at the front door, free showers in the gym, etc. Hell, I even ride by a hospital in case I suffer from a heart attack on the way. I’ve been an avid cyclist and have bike raced for decades… and ridden more than 150,000 miles. Cycling isn’t foreign, I’m good at it, traffic doesn’t bother me. I have so many bikes in my garage I can’t park a car in it. There is (was!!) absolutely zero reason to drive my Honda minivan to work, other than wanting sleep the extra 17 minutes. So, last night I pulled out the old commuter bike, put some air in the tires, found my old lights from when I used to do 24-hour mountain bike races and charged the batteries (and was psyched they still worked! ), found the bike locks, clothing, and helmets. This morning, my 5-year-old son and I got up, had a nice breakfast and we rode to kindergarten. He was SO HAPPY to ride to school he could barely contain himself. I dropped him off and continued to work, took a free shower there (no water or gas to heat it on my dime) and went into the office invigorated and stoked to have seen the sun on the Flatirons and Indian Peaks while breathing the crisp air. I’m not sure I’ve noticed the sunrise on the Flatirons in a while, from the car. Crossing over the disaster that is Hwy 36 west-bound into Boulder at 8am was a special treat, a delight to see from 20 feet up on my nearly private road with 12′ bike lane. I couldn’t help but notice all the (newer) large SUVs passing with just the driver. One could almost see the money falling out the tailpipe. The ‘stache is small, just 5 o’clock shadow right now… but I don’t think I’m gonna shave it tomorrow either. Or Friday for that matter. Wow. I think I just shed a few tears… I love how you didn’t make excuses and just did it. Our 5-year old loves the bike trailer and even on the coldest of days, demands that the front stays open so he can feel the cool breeze. Today was day 7 without starting my car! It’s rewarding AND fun to commute by bike! Last night I combined my evening trail run with a trip to the hardware store for a couple of PVC pipe fittings… it was great! An interesting side observation of not using my car: I spend a LOT less money because every trip has to be planned and considered (then dressed for). Hopping in the car to run to Home Depot to start some other project was always WAY more fun than finishing the 17 in-flight projects… but now I find myself saying “I have the materials on had to do XY & Z, so I’ll finish those up today instead”. What type of bike is best suited for pulling a trailer full of stuff? I don’t have a bike, but I was thinking of getting one. How do you ensure that no one steals your bike trailer while you are shopping for groceries? Our trailer is very easy to disconnect, and I worry that it would be easily stolen. I lock the trailer and bikes up with separate locks. It is usually pretty easy to find a place to put locks on both the bike and trailer while keeping them connected. I agree – it is easy to lock a trailer to your bike, or to a bike rack, or both. But I don’t do either, just because a trailer only costs $50-$100 anyway and the chances of it getting stolen are pretty low. You’d have to have a person who happens to be a thief, who happens to want to steal a very bulky and inexpensive and hard-to-resell item that is not desirable to the under-30 males set who usually commit petty crimes like that. And this person would have to happen to be walking past your grocery store at exactly the time you happen to be inside shopping. MMM — perhaps I’m being a little paranoid, but our trailer was closer to $400 and we use it every day going back and forth to school. I will get a lock for it so that I won’t have to worry about the grocery store. I see shady characters hanging around, and petty theft is an issue here. However, I’ve been wanting to use it for grocery shopping many times but worried about it being stolen. The climate here is mild and the store just a mile or two away, and now I will do it! I purchased a Bikes At Work trailer a few years back after I figured out I loved bicycling and wanted a good way to carry cargo in order to go down to one (or zero) cars. The trailer is worth more than my bike (but a heck of a lot less than a car) and decided I should at least put a decent lock on it. Since it is pretty easy to lockup, I don’t think anything of it. I’m still learning how to effectively pull everything I want to since it requires some skill (I’m still working on developing) to pull awkward or heavy loads. I really love the challenge of pulling different things, though! I never considered locking the trailer separately — thank you! Nearest grocery store to me is about 3/4 of a mile away, which is prime biking distance. I usually don’t do much shopping since I live with my parents, but I wanted something really quick so I got my backpack and hopped on my bike for the short trip down the hill. The biking part itself took only marginally longer than driving, especially since there are several stop signs and stop lights between my house and the store. Having never biked to this particular store, I figured it would be straight-forward. While this isn’t the poorest part of town, it is populated w/ more of the working class than other areas so I figured someone must bike to this place from time to time. Upon arrival, I discovered that they actually don’t even have a bike rack (at least not in a highly visible place), so I was forced to use the gas price sign to tie my bike up. Next time I go, I intend to make sure I didn’t just overlook the rack and write to the company and also the city if they really do lack one. Definitely the mustacianism rubbing off, but it now seems very absurd to have no bike rack available at a store in a neighborhood where most people could hardly afford to be driving. We do utility runs to the recycler dude and into town to get groceries and dog food; the grocery runs are 18 miles total, our dog food runs are 29 miles total. We still have the goal of making our Costco run – that will be a 44 mile round trip! I made my own flat bed trailer which has a load range of about 450 lbs. My wife and I love doing our errands via pedal power – 5 days a week we ride to the Post Office to get the mail, (12 mi.). Nice blog, glad I found a link to it!! Baby steps . . . our daughter and her fiance plan a car-free day each weekend, walking or biking to do their errands rather than driving, and has challenged us to do same. So we are trying, beginning with baby steps. The last two Sundays we have walked to our local grocery store, health food store and home improvement store, all within a couple of blocks of each other, to pick up some small items not purchased during my normal Big Grocery Shopping Day. We took our dog with us both times and thoroughly enjoyed it. Both times we’ve run into people we know, stopping to chat about why we are walking to the stores instead of driving. It’s been a lot of fun . . . who knew! My spouse retires in the next few months, and I suspect we will be moving up to biking on Big Grocery Shopping Day instead of driving, as he found your site before I did, and he has long been threatening, oops, I mean saying :-) that he would like to do this. I too have come to see the light about using the bike as a grocery hauler several years ago when I was living in Berkeley, CA. Driving and parking in Berkeley is a nightmare and literally the fastest mode of transportation in Berkeley is by bike. However, I disagree that one needs a bike trailer to haul a week’s worth of groceries by bike. Grocery store clerks pack reusable bags full to the brim so everything usually fits in two bags and a backpack. I have found that the best method for transporting the two full bags is by simply hanging them off of the sides of the handle bars. It feels a little weird at first and the bike is naturally heavier, but the weight of the bags is supported by the bike. And the best part is that one doesn’t have to shell out the money for the trailer and have to deal with the annoyance of having to attach it to one’s bike. However, the amount of money spent in the cost of the bike and the trailer are well worth the amount of stress saved from having to drive in a city. City driving is for peasants. The bad part about reading some of these posts: that nasty consumerism is creeping in. While I’m trying so hard not to buy anything, now I want one of those snazzy keep cool bags and a bike trailer! Heheh – now you’re ready for the tricky part – separating consumerism from conscious investments.. tools from toys. You wouldn’t hesitate to “spend” $5000 on buying more shares of the conservative index funds in your retirement savings account, right? Because they are assets rather than liabiities – they PAY you for owning them. So it is with a bike trailer, a bike, and the grocery bags that allow you to get the food home and keep it fresh. My bike and trailer provide way over 100% ROI every year. And the keepcool bag was about $7 at Costco. Thanks, MMM. I was sort of kidding. I think I better try the bike-plus-backpack thing first, though, and make sure I’m comfortable on the road. I ride to work through a greenway park most of the way, so I’m used to feeling relatively safe. The route to the grocery store, however, doesn’t have any sidewalks or bike lanes. I’m curious in case you respond again: are you comfortable with the trailer on a regular stretch of road with no sidewalk or bike lane? I’d have about 1.5 miles to go. And she was in a ton better shape than me. So I finally got a bike trailer ($30 off craigslist, though I sort of feel like I should have bargained down to $20 considering all the rips in the fabric). The issue I have is that the “floor” of the trailer is just a weak fabric which sags a lot when I put heavy things on it and feels like its going to rip like the rest of the fabric soon enough. For the moment I’ve been taking the heavy stuff from the store and buckling it into the seat which has some strong supports, but I’ve been scheming of a way to take out the seat and build a new floor for the trailer so it can handle serious loads of groceries. My current crazy idea is to find some used seat belts and just weave a floor out of them, but we’ll see what the final product ends up like. Just got groceries with a bike trailer for the first time ever, using a trailer I just got from a recent hauling job. It was originally a child trailer, but the seats were taken out so it could be used for a dog. 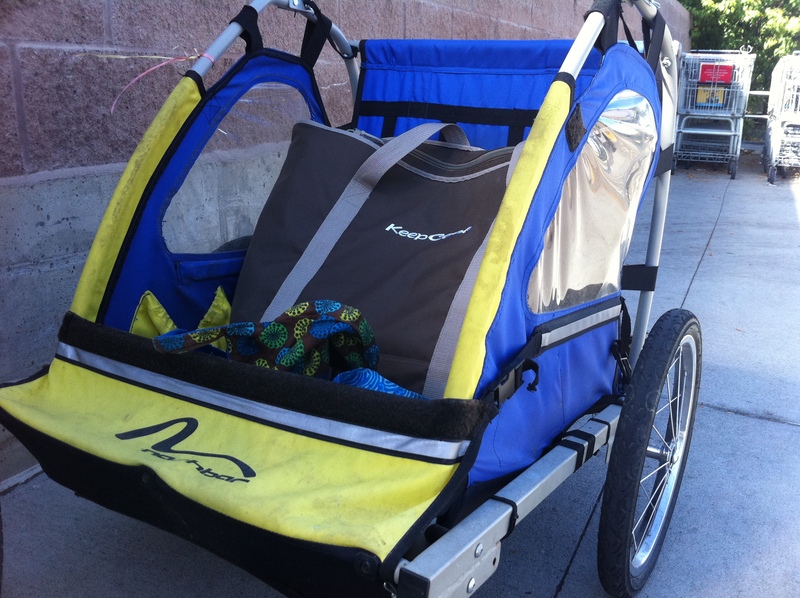 It works perfect for groceries, and its small and light enough to tow with my folding bike. I never drive to get groceries, but being able to go by bike meant I could go to the independent natural grocery a couple miles away instead of the supermarket that I usually go to because its walking distance from home. Oh MMM I am so converted to Mustachian living now. I’ve been working my way through your posts since discovering this site last week. I am totally up for the grocery shop by bike this weekend and even my 11 yr old daughter is badass enough to come with me. I am failing on the commute to work part but I cannot justify the extra time to reach work (18.5 miles each way) as I would need to get a child minder for my kids after school. However I should be able to get a post within 5 miles from home in the next 12 – 18 months and I will be biking it in all weathers then. Husband already does this as he is lucky enough to be 4 miles from his place of work. As of this weekend, we are the proud owners of a Burley Nomad cargo trailer. The trailer was purchased with a gift card, meaning $0 cost to us, and we just returned from using it to pick up some items at both Walmart and Trader Joes. Aside from all the benefits you’ve already listed, we also enjoyed seeing people smile and nod at us from their idling cars in recognition of how darn cute the trailer is, and how much fun we were obviously having with it. We attribute our desire to even “go there” and begin doing our errands on bikes to both this post, and the one titled “What Do You Mean “You Don’t Have A Bike? !” ‘ So, thank you very much MMM! I’m just getting ready to go to the grocery store…on foot. It’s a 10 minute walk and much easier than biking. If I took the bike I would have to mess about with finding a place to lock it etc. Walking I can just take the cart into the store with me, load it up and be on my merry way. Easy peasy! I can say that reading this blog has inspired me to bike to work for the past week. What used to be a 30 minute walk is now a 10 minute ride. Sweet! I’ve never owned a car and in fact don’t have a licence so I’m more than acustomed to walking/biking/public transportation. This blog totally kicks arse. I’ve also been inspired to ramp up my mortgage payments next year (the earliest I could fit it into the budget), effectively wiping out another 9 years off the length of the mortgage. Now that’s exciting! Part of the point of these antics is to show that if I can move this kind of load by bike, surely others can use their bike to get milk. For those of you that bike in urban areas (especially women, but I suppose this applies to anyone really)…do you ever have issues with biking through dangerous neighborhoods? I’m in a city, and my home is on a nice block with less-than-desirable areas surrounding it (cheap rent, hooray)…almost everything I’d ever need on a day-to-day basis is within an hours bike ride, but when I google mapped the route, the streets I’d have to pass through make me pretty fearful – especially now that it’s getting dark early. Public transportation gets me to and from work every day in about 10 minutes at $83/month for an unlimited pass – the only thing is that the trains are chronically late and crowded, but that’s just annoying more than anything as my job is flexible. I’m talking more errands (like the grocery store) and my monthly trips to the chiropractor and little things like that. Any suggestions? I don’t know what city you live in, but I know some people say I live in a dangerous area just because it is low income. It’s not necessarily unsafe and actually during the day I feel it is safer as the neighbors watch out for each other. Whether or not is is a dangerous neighborhood you can take percautions. My recommendation is always carry mace.Try to ride in more public areas (stay away from allies and abandoned industrial complexes.) Use established neighborhoods as much as possible. Try to do your errands during the day when there is less chance of danger. Try to meet others in your community that ride bikes and ask them safe routes from experience. Hope this helps. I’ve occasionally heard of people in Oakland getting “bike jacked”, but its been pretty rare, compared to muggings of pedestrians. I’ve never been messed with when on a bike, nor do I know anyone who has, but I have been on foot a number of times. Criminals like easy targets, and a fast moving one is not especially easy. If you can find it, you might try to find out the statistics for your own particular city. And incidentally, men are statistically the victims of violent crime more often than women are. We just have a culture that perpetuates the myth that women should be scared and feel vulnerable all the time, but it isn’t really backed up by reality. My sister was riding her bike through a questionable neighborhood and a local actually told her she shouldn’t be there. I think that’s a pretty good indication that there might be danger there for her! So I think this is a valid concern. I like Tanner’s suggestions. You have spurred me into getting a bike trailer with your cycling posts. The irony is that I’m an avid cyclist, usually ride 7-10k miles per year, I have a bunch of bikes including a heavy duty commuter with racks and panniers..yet I still often drive to the grocery store because I think my grocery load will be too big or heavy. I had considered getting something like a BOB trailer a while back, but couldn’t bring myself to spend the money. Thinking in a bit more Mustachian fashion now I’m scouring CL for a used kid hauler. I’ll report back when I’ve picked one up and ridden home with a 50 lb. bag of dog food and groceries. Just bought a bike and trailer on craigslist for $100 total (the bike is just a cheap Schwinn cruiser)! Can’t wait to use it for grocery shopping! My husband and I discovered your blog about a week ago and have become Mustachian converts! Love the blog, keep it up! Newbie here – have started reading all the MMM posts from the very beginning and loving all the humour, tips and advice. Wifey and I both rode to the grocery store just last week (got inspiration from reading the previous biking posts) and got what we needed in our backpacks. Very pleasant ride (only 1.8km each way) and felt great afterwards. Just need to get a trailer now! Been biking to the grocery store for a few years now, and got a trailer last year (before I even came across this site). Needless to say, going to the store (even the super busy supercenter) is fun again. No stress and no traffic jams. Now if I could get rid of the 20+ mile commute to work, the car would be totally unnecessary! I was looking at the Nashbar trailer. Would you recommend it? How do you think it compares to fancier brands like Burley? The Nashbar one held out pretty well for a few good years. Then I found a much nicer Burley Dlite on Craigslist for $100 or so (they are almost $600 new!). Burley is definitely better made, and bigger, which is very handy for carrying two kids. If you are patient and live in an area where people have both bikes and kids, it’s worth scoping the better trailer out on Craig’s. But for a quick and easy solution, the Nashbar one is nice too. I’ve been grocery shopping (and auto part shopping, and clothes shopping, and hardware store shopping) by bike for years. I currently use a Burley Travoy trailer and tow it most times, most days, whether or not I’m intending to shop. IN the past I used Wald collapsable wire baskets mounted level and off either side of it, and can carry an amazing amount of stuff on the bike that way, particularly if i fill the baskets, then lash a large cardboard box over the whole setup and tie some bags off the side of the wire baskets. Tbis setup requires carrying rope and bungie-type things. (though i don’t like bungees and prefer using old bike inner tubes because they are more adaptable and won’t ever snap back and take your eye out with a hook). However, though I can probably carry just as much with that setup as with the trailer, I prefer the trailer setup because I can wheel all the stuff right into my house without an elaborate bike-unloading ritual. Also, the trailer helps preserve the rear wheel of the bike, which is an easy $150 expense and isn’t known for its robustness on a derailleur bike, by removing most of the load from it. Fringe benefits: The trailer is great for bike touring, an inexpensive and badass vacation. Basically backpacking with bikes, covering way more ground with no burden on your back. Also NOBODY will bother you on the road b/c they think there is a kid on board. I’ve had too many bikes stolen to leave a trailer attached to my bike while going grocery shopping, but since I don’t have a lot of groceries on a per trip basis, I think I’ll take my bike and a backpack this week. If nothing else, it’ll mean I can’t buy any soda, which should cut down on the bill a bit (4.99 per 12 pack, 2 12 packs per week, roughly $520 per year). And there we’ve got another advantage. I know I am late in to the party, but . . . So yeah, I think I’ll be doing this regularly. I had already decided to get a bike trailer, but this post made me realize something even more important… I have to take over 100% of the grocery shopping for my family. My wife just doesn’t have it in her to “make this chore worse by bargaining the whole time she’s in there” whereas I do it instinctively. saw this on the wall street journal and wondered how much of this trend was influenced by MMM. I think all of your readers might have enjoyed a picture of my setup last summer: bike, bike trailer with 2.5 year old and 1 year old, stroller and cooler bags in the back of the trailer. We biked to the church, walked around the church parking lot with some other moms (didn’t realize I would be doing that, otherwise I would have looked harder for a bike trailer/stroller combo), then biked to the grocery store. And yes, fitting a weeks worth of groceries plus the mouths that it needs to feed was pretty difficult. Unfortunately, we can’t do the same this summer, but for the most fortunate of reasons: our 2 month old! I realize this post is years old, but I was inspired. I bought a bicycle trailer this morning. Tested it with my toddler around the neighborhood (he loved it) and then biked it (without toddler – not ready for that step yet) 1 mile down the road to the Neighborhood Market to pick up grapes and salsa. I feel a bit like a fool for ever driving it. AND I’m overweight. AND I’ve probably only biked 30 miles total in the past 10 years. I did just fine. New to the blog, but have to post! Even if we had a car, I’d still bike. We live 0.5 miles from two grocery stores, and I’ve timed it when we borrowed a friend’s car for the weekend – between walking out to street parking, getting to the main street to get to the store, parking, walking in, it’s faster to bike. I keep my bike in our apartment, no parking. I ride the Interurban trail, no street riding at all, only two stoplights as opposed to the four I’d have to go through in a car, and I lock up right by the door. Even adding in detaching the trailer, it’s still faster. I ride rain or shine, though I draw the line at night because I don’t have proper night gear, specifically powerful enough lights, as there’s one section of the trail that’s not well-lit. Then I take the bus. I’m lucky in the sense that I have a big grocery store right next to my workplace and I’m driving past it every day to work and from work, so I can do the shopping conveniently on one or two days of the week. The trip from work to home and vice versa is about 12km per direction, which is not too much for biking, but what do you think, maybe I can justify one or two days commuting with the car when shopping the groceries? I haven’t seen this asked or answered anywhere. How do you secure your purchases in a bike trailer when you are making multiple stops? I have cable locks for my bike & trailer but the bags with my just-bought stuff would just be sitting there, easy pickin’s, if I were to go inside a 2nd or 3rd store. What do others do? I thought about running the bike lock cable through the tied-off handles of the bags. That might be enough to deter someone from grabbing an entire bag but they could still fish out the contents of the bag easily. You wouldn’t know it from this comment but I generally feel quite safe and do not worry much about crime — this just seems like a situation where unattended stuff would be very tempting for an opportunistic thief. My strategy is just to assume thieves are rare. So far, so good after many years of this. Remember the math behind it: both the odds of loss and the cost of a potential loss are both very low. I’m happy to report that thanks to this post, my husband and I got bike racks! and I now have saddlebags plus a basket in front, and he has a cargo crate plus his backpack. The grocery store is 2.5 miles away. I’m a wimpy biker like Mrs. MMM used to be, yet found this to be as easy and a lot more fun and satisfying than going by car. And we felt like badasses biking home with our food and our 6-pack of beer in the crate! I have used the wire baskets (English market baskets, a fancy name) for errands and small item groceries for a number of years. The size the of baskets does limit impulse buying and helps to stick to the list. No parking hassles :-). For multiple stops, use a messenger bag that goes into next store with me, lock up bike, and save groceries for last stop. The trailer does look enticing for those unexpected found on sale items however, a great idea. I’ll do you one better: I transport everything (groceries included) in a milk crate strapped to a rack over my rear wheel. I like it because I never have to take it off. It’s light enough and out of my way, so riding with it when it is empty is like riding a bike without a rack at all. The other benefit is that it limits my purchasing power. As a single guy, and former fatty, I tend to be an impulse grocery shopper. Since I’ve done everything with limited transporting space, I know I have to stick to the essentials. One cloth bag and I’m done. After my chicken and veggies, sometimes I can get a tub of ice cream, but usually there’s no room for my fatty urges. Win-win-win. Hope I’m not tardy to the party. I recently started reading mmm and I was inspired to buy a bike and complete this challenge. I only took a backpack and picked up a few items, but the experience was invigorating! I’ve been meaning to buy a bike and get in shape for years, so I stopped thinking and started doing. Thanks mmm! I’ve grocery shopped by bike. I have to bring another person with me so (a) my bike doesn’t get stolen and (b) in case I have a cardiac event. I prefer biking to work, mainly because I don’t need to lock my bike there and I’m not too worried about cardiac overload. Plus, I don’t have a means of carrying many groceries. I found your blog precisely because I was looking for a way to haul more groceries. Amazon is sending me a lock next week. I wouldn’t have replied except I got a pedestrian (ha ha) Geico ad instead of the cool ad you menfioned. I’ve been reading your website for the past couple weeks and really enjoying the education. However, I kept dismissing your biking advice for my situation. As I read this, I realized I was coming up with excuses why it wouldn’t work, and tried to think instead if there could be a way to make it possible. I am a stay-at-home-mom of four young kids (ages 1 to 6) who are almost always with me. We are moving and will live about 7 miles outside of our small town (almost all on the 101 highway, just a bit on dirt road) and generally consolidate all town-errands for fewer trips. So I’d like to be able to carry a stack of library books, kids’ gymnastics clothes, diaper bag items, and groceries from a small, perishables-only shopping trip (most groceries we stock up when in the city, as they are so expensive in town). I could get a bike for me, one of those attach-on-the-back things for my six year old, a baby seat for my one year old, and a bike trailer for the three and four year olds. Can you use both a bike trailer and ride-along attachment on the back at the same time, or does the trailer attach only directly to the back of the adult bike? If I can use both at the same time, could I move the thing once we were all loaded up? I could probably fit library books and other items in a backpack, but not the groceries, too. Do they make trailers with any extra storage space, or would it be totally full with two kids? I must say, I’m really curious if you are going to tell me to just buck up and I can make it work, or that I am the exception to your biking rule until my kids get older and can help pull their own weight! I didn’t realize until I was selling our trailer-bike that although you *can* hook a regular trailer onto the back of it, you are not supposed to. The tag-a-long we had (Burley Piccolo — one of the better ones on the market) says the weight being pulled at the hitch should max out at half the weight of the lead rider. A trailer on the back of the trailer bike is almost always going to cause you to exceed this limit. I ignorantly did it a number of times with no problems, though. It is cumbersome and kind of a spectacle, but do-able. Many/most bike trailers have room for 2-3 bags of groceries in addition to the passengers. All right, I know this post is super old, but I have a question. My husband and I have started getting the groceries by bike (yay!). The first couple of times we just took backpacks and did small trips. Since then, we’ve purchased a trailer (from Craigslist!) and are anxious to use it for grocery hauling. I do have one logistical question though, how do you lock up your trailer? Currently we both use U-locks for our bikes, but the trailer attaches with just a lock pin, no key or additional security. Thoughts? Great job! You can either add a second little lock cable, or do what I do which is to assume that nobody will bother stealing your trailer. After about 9 years of trailer ownership, I’m still correct on that assumption. Thieves aren’t as common as many of us assume. I will add my supporting anecdote to the thieves-don’t-care-about-trailers theory. My fiance and I have had three bicycles stolen from my apartment garage, so safe to say that bicycle thieves are common in my area. My bike trailer was unlocked next to those bicycles the whole time and not stolen yet.